AngularJS is based on the client-side generation of html-views and extends the html vocabulary. This way it is possible to use more functionality in the frontend without changing the DOM via jQuery. 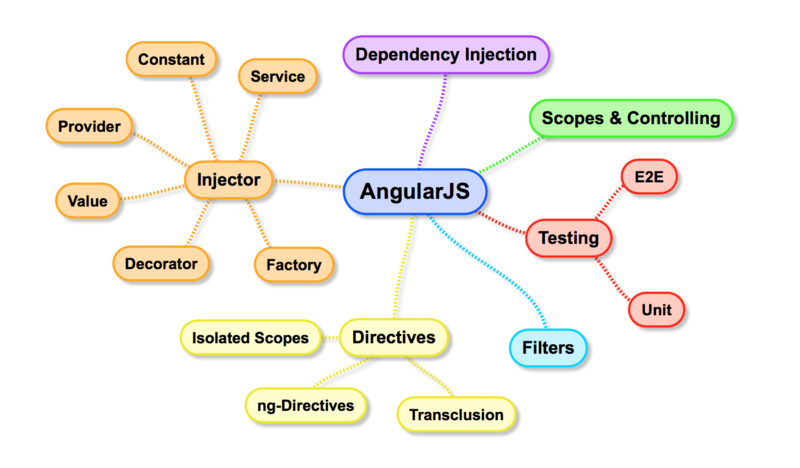 The main concept of AngularJS is underlined by controllers and directives. Additionally, AngularJS relies on the concept of “Single Source of Truth” which is realized with two way data binding. It is achieved with so-called “dirty checking”, which regularly checks for changes on a scope variable. These build the basic structure of an application in AngularJS. They connect the views and the functionality of your app and control the data flow. You can use scopes to pass variables to the view and interact with them. Also you can define functions in the controller which then can be executed in the view. As already said, AngularJS excels at making HTML code expressive and readable. The main reason for this are the directives, a powerful tool to manipulate, extend or even replace elements of the DOM. You can think of the directives as templates: You can write element and attribute directives (there are other types of directives but these aren’t used that much) which you can include in your HTML code as own tags and attributes. So instead of several tags like you can simply have with its content being laid out in a seperate file. Directives offer developers many ways to accomplish functionalities in a simple, efficient, and testable manner. The overall point of a directive is to hide DOM-related complexity and create a solid medium between the model and the view. AngularJS offers filter functions which go through records and filter them according to certain criteria. A filter can change a list or value dynamically. AngularJS brings some filters but custom ones can be created as well. Why not jQuery instead of AngularJS? Well, you cannot compare these two very well. While AngularJS can be used as a whole framework which determines the way you build your app, jQuery is just a library. You can include it in your web app (even when using AngularJS). AngularJS is component based, therefore you can use TypeScript and ECMAScript 6. You don’t have controllers and scopes anymore. AngularJS 2 is said to be the technology of future web. Therefore, older versions of Internet Explorer aren’t supported. The oldest version supported will be IE10. Also, Angular will focus more on mobile devices, especially on using touch. The performance of AngularJS is lacking when too many objects are binded. Since the data binding changes in AngularJS 2, this will be greatly improved. AngularJS is very powerful for writing single-page-applications. You can do more stuff in less time. AngularJS handles a lot of situations automatically or with small code. It’s easier to do animations and DOM manipulation. In following blog posts we will cover the technical aspects as well as the implementation of the modules mentioned above.